MEASAT-3b is processed for launch inside the Spaceport’s S5 payload preparation center for Arianespace’s Ariane 5 Flight VA218 (photos at left), which was followed by this week’s arrival of its Optus 10 co-passenger – delivered to French Guiana’s Félix Eboué Airport by an Antonov An-124 cargo jetliner. The Spaceport is busy with launch campaign activity in support of Arianespace’s record 2014 mission pace, with parallel preparations now underway for three heavy-lift Ariane 5 flights, as well as another with the medium-lift Soyuz; all to be conducted from French Guiana. With the activity underway – and the four launches already performed since January, using its complete family of the heavyweight Ariane 5, medium-lift Soyuz and lightweight Vega – Arianespace is on track to perform 12 missions during the year from the Spaceport, setting a new operational record that would surpass its 10 flights in 2010. 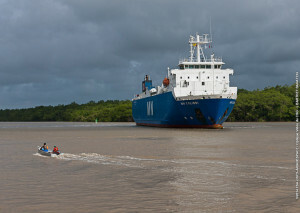 Launcher components for Ariane 5’s Flight VA220 were delivered to Paricabo port in French Guiana aboard the MN Colibri, which is one of two sea-going ships used to carry Arianespace vehicle components from Europe to South America. Key steps this week for the upcoming flights included arrival of the second payload for Arianespace’s next workhorse Ariane 5 launch: the Optus 10 satellite, which has since joined the MEASAT-3b co-passenger, delivered in mid-April, for checkout at the Spaceport. These two spacecraft will be lofted May 28 on a mission designated Flight VA218 in Arianespace’s numbering system, signifying the 218th launch of an Ariane-series vehicle. The mission’s launcher, an Ariane 5 ECA version, is located inside the Spaceport’s Final Assembly Building, where it stands ready for MEASAT-3b and Optus 10’s upcoming integration. Another major milestone achieved during this week’s activity involved the vehicle for Flight VA219 – an Ariane 5 ES variant, tailored for missions to low-Earth orbit – which completed basic assembly at the Spaceport’s Launcher Integration Building with installation of its vehicle equipment bay and EPS storable propellant upper stage. Flight VA219 is to loft the fifth, and final, European Automated Transfer Vehicle (ATV) for servicing of the International Space Station. Ariane 5’s EPS upper stage is designed to be reignited during flight, a capability required in the mission profile to deliver this ATV resupply craft – named Georges Lemaître after the Belgian physicist and father of the Big Bang theory – for its space station rendezvous. Once this Ariane 5 has been processed in the Spaceport’s Launcher Integration Building, it will be delivered to Arianespace for installation of ATV Georges Lemaître and the final operations leading to launch. Rounding out the on-going Ariane 5 mission preparations was this week’s delivery to French Guiana of launcher components for Arianespace’s Flight VA220. 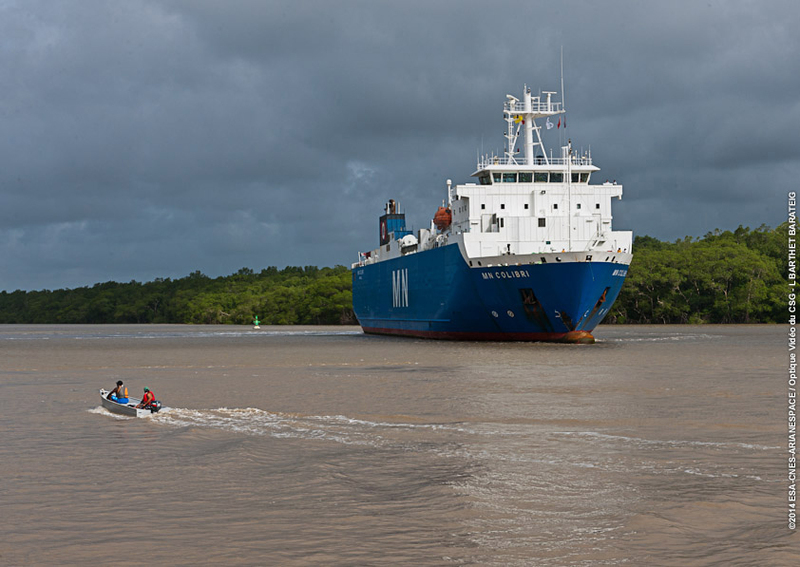 Arriving aboard the MN Colibri sea-going vessel, these elements were unloaded at Paricabo port for transfer to the Spaceport – where they are to be assembled for flight. The Spaceport activity isn’t limited to Ariane 5, as preparations also are advancing for the next medium-lift Soyuz flight from French Guiana – designated VS08 – on Arianespace’s second mission loft a cluster of four O3b Networks spacecraft. This launch follows Arianespace’s June 2013 orbiting of the initial four O3b satellites, which were produced by Thales Alenia Space and provided the first step in O3b Networks’ creation of a space-based constellation for Internet services over Asia, Africa, South America, Australia and the Middle East. Arianespace’s four missions conducted so far this year have utilized its full launcher family: Ariane Flight VA217 in February, which orbited ABS-2 and Athena-Fidus; March’s Flight VA216, using an Ariane 5 to deploy ASTRA 5B and Amazonas 4A; Soyuz Flight VS07, which orbited Sentinel-1A in April; and this week’s Vega VV03 success with Kazakhstan’s first Earth observation satellite, KazEOSat-1. In the two photos at left, the ring-shaped vehicle equipment bay and EPS upper stage for Flight VA219 are hoisted inside the Launcher Integration Building for installation atop the heavy-lift Ariane 5. The vehicle equipment bay nears its launcher in the second photo from right, followed by the EPS upper stage being lowered for integration.